"He's looking so unique and is such an interesting little mix. His name is Sebastian; his mother is a Husky and his father, a Silkese (Maltese / Silky Terrier hybrid). He has the ice blue eyes of his mother, which are absolutely stunning! We don't know where his color is from but it could stem from the Silky Terrier side; his coat is of a salt-and-pepper shade. 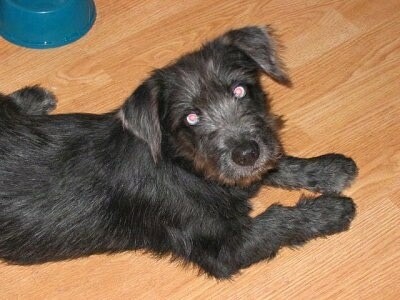 I don't think he'll get big; his legs are rather short and he reminds me of a Schnauzer right now. We'll just have to see! I've had him for a few days now and he has already caught on to the housebreaking! He has not once pooped or peed in the house or in his crate. He waits patiently until I take him outside to do his business...and this at age 4 months! Sebastian also gets along fantastic with my two cats; he'd like to play with them but they pretty much ignore his advances ;). He's quite the snuggle-bug as well, loves to sit on the couch with me to get his belly rubbed. When it's time for food, he dances and hops around like a little bunny and lifts his paws. Quite the artist, I might add!" "He gets along splendidly with my other dog, Julius, a Labrador / Pitbull mix (shown here at 1 year old; I like to call him my Labrapit) and they tire themselves out, which is fantastic. Considering he's never seen a leash, he's been doing quite well. He gets easily distracted by noises and tends to stop in his tracks for a while but we are working on it. He seems to prefer to walk on pine straw or grass, rather than the pavement. I suppose that'll change with him growing up as well. Other than that, he's one happy little fella :)"
"This is my Husky / Timber Wolf mix named Lexus. She is a female, 20% Husky and 80% Timber Wolf. She is 1 year and 6 months old in this picture and enjoys playing with our other dog, Psycho (mutt). She loves howling every time she has a chance and likes to destroy and bite on things all the time!" "This is Simon, a Husky mix. He has one brown eye and one blue eye. He is a skilled and very fast runner. He talks with the common Husky verbal chatter." Simon is shown here at 1 year old.